"International Women's Year World Congress Rules, page 4"
Pages four and five of the rules pamphlet for the International Women's Year Conference held in Berlin, Germany on October 24th, 1975. Central Washington University Political Science professor, Dr. Usha G. Mahajani, attended the event as a member of the India delegation. 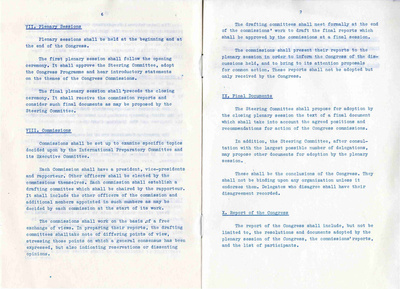 This pamphlet sets forth the rules of conduct for committee members over the course of the conference. "International Women's Year World Congress Rules, page 4" (1975). Washington State Conference for Women, 1977. 244.